Sherrie Scraps with passion: Happy first day of school! 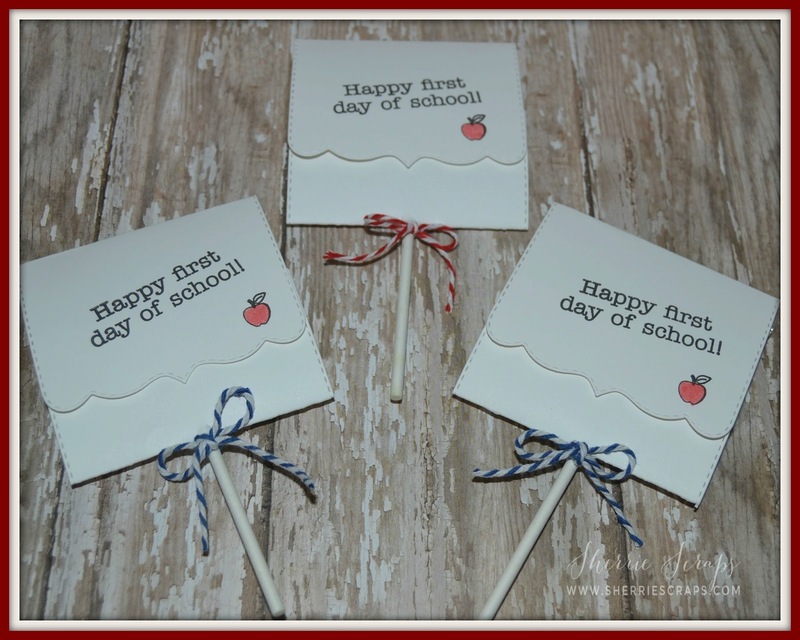 Today I am sharing a fun back to school project. I made a few treats for Arya to hand out to her preschool classmates and Teachers to start off the year~Today is her first day back and she is so excited to see all her buddies! For the little kiddo's, I used My Creative Time's Card Sentiments stamp/die set for the sucker holder. I kept these really simple as they are going to just rip into them anyway for the sucker, lol! I stamped the cute little apple and sentiment with the Write On stamp set. I colored the apple with Wink of Stella and tied on a twine bow from my stash. The Teachers treats are gable boxes from Jaded Blossom. I made a cute tag using the Luggage Tag Dies and the cute little images are from School Dies set. I stamped the adorable face on the glue bottle with PK Bucket List of Emojis face asst. So cute, ha? 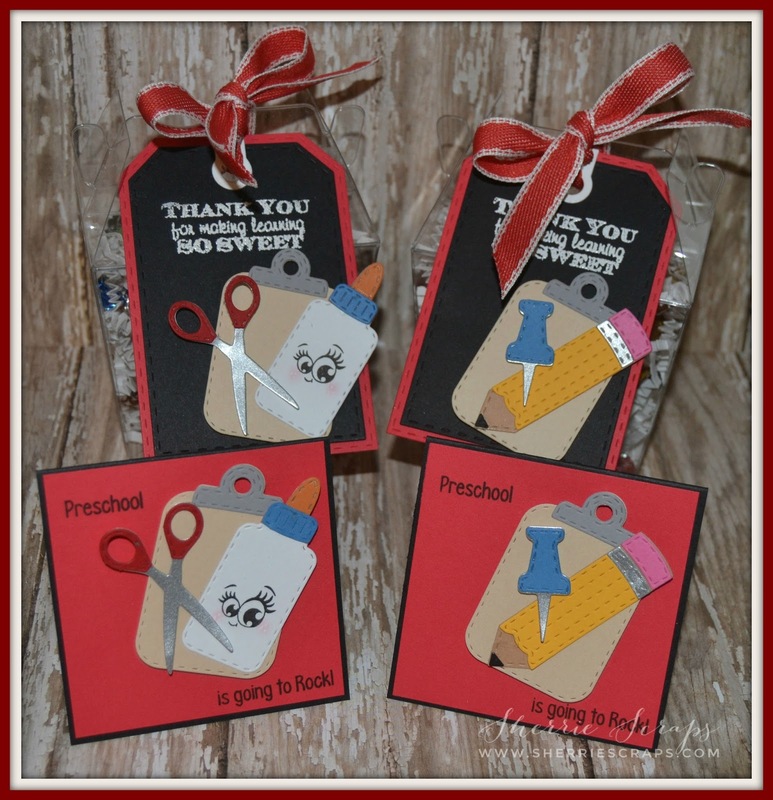 The sentiment is stamped and heat embossed with Teacher Appreciation stamp set. I tied on a pretty bow from SU to finish it off~I also made these little matching cards for the Teachers so Arya can write them a little message wishing them a good year~ The sentiment is from the School Rocks stamp set. What fun and creative projects. Arya will sure be the hit of the classroom with these cutie. Love the images used on the teachers gable boxes. They are adorable. so sweet Arya will be a star with these. thanks for joining the linky party! Great idea!! The kids and teachers are going to love it!! So cute!! Oh my goodness, these are all so adorable, Sherrie!! Arya is going to be the rock star of preschool!! The suckers are so fun!! I love the gable boxes and the cards!! You layered the dies perfectly!! Those faces on the glue bottles totally make me smile!! The kids - and teachers!! - are going to adore these!! Thank you so much for linking up at DL.ART!! These are super Sherrie, The kiddos are going to love them. I love them- what fun teacher thank you's. I just got in from a walk and it was 54 in CA I high today was 58. OMYGOSH!!! These are all soooooooooo fun! I love love love all the school goodies you incorporated!!!!!!!!!!!!!!! These are so wonderful! Super duper cute. I am sure that everyone loved them! Such fun projects Sherrie! You always make the cutest things! So fun and creative! What a fabulous projects!! Everyone will love them!!! Have a great day. Your projects are adorable! I bet they were a hit for back to school! Absolutely love those Peachy Keen Faces too! What super adorable treats!! I am sure Arya's class loved them ! Oh these are super cute Sherrie! Arya's teachers and classmates are going to LOVE these! What a cute idea to package up the lollipops! Now I need to go purchase that die so I can do this too LOL .... and I love the cute little faces on the glue! These are fantastic my friend! I hope Arya has a great first day and comes home with so much excitement and lots of stories to share! 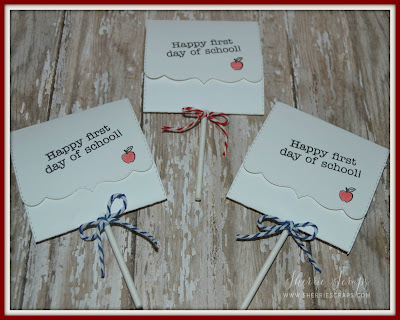 These are so sweet and i'ts very sweet of you to make for Arya to give to her class and Teachers! Darling! Thanks for sharing at Jaded Blossom. These are so sweet, Sherrie! I'll bet the teachers and Arya's little friends were all delighted with them! So true about the little ones just ripping things open too! The sucker is what counts when you're that age! Omgoodness, those little faces are just the cutest things ever! What absolutely uhhhhdorable back to school treats, Sherrie! Love the idea of a sucker wrap for the kiddos! I would have been over the moon to receive such a treat. And your teacher boxes are awesome! Love the die cuts and love the sentiments. Absolutely adorable! These are so cute! I'm sure her friends and teachers loved them! I can't do that anymore...I now have 18 grandkids, I know I can't believe it myself. These are super cute! Love the fun PK faces you added! Thanks for playing along at Jaded Blossom! These are both sooo awesome!! Love that white embossing, it really stands out. Thanks so much for participating with us over at Jaded Blossom! I have been so emotional today. So to keep my mind off things, I thought I would come over to your blog. Your creations are so cute, I'm sure the kids loved the little surprise. Your such a good grandma. I love the fun ways you used the JB dies! !Especially the school dies set! Totally cute, fun and yummy!! Oh....how fun! These pretty treats are sure to be a hit with students and teachers. I know everyone loved receiving such cute, thoughtful goodies! These are so awesome!!! LOVE! Thanks for playing along with our challenge at Jaded Blossom. awesome use of the school dies ! love the layering and the cute cards and treats ! Thanks so much for joining us in this months Jaded Blossom Challenge ! Great school cards and treats ~ awesome job!! Thanks for playing along at Jaded Blossom!! So cute! Thanks for playing along in the challenge! So super cute, Sherrie! Thank you for playing along with us at Jaded Blossom!